As regular readers of PopCult may know, I’ve been battling a stubborn case of bronchitis for several weeks. I am doing much better now, but during my down time, when I and Mrs. PopCulteer, Mel Larch, were laid up, medicated and not wanting to do anything too challenging, we found ourselves playing this game. The nice folks at Playmonster had sent me Yeti In My Spaghetti to review here in PopCult, and I’d planned to let my nephews test it out and report on the results, but since we were both feeling a tad contagious and lethargic, we decided to stay at home and try it ourselves. We had more fun playing this game than anyone our age should. 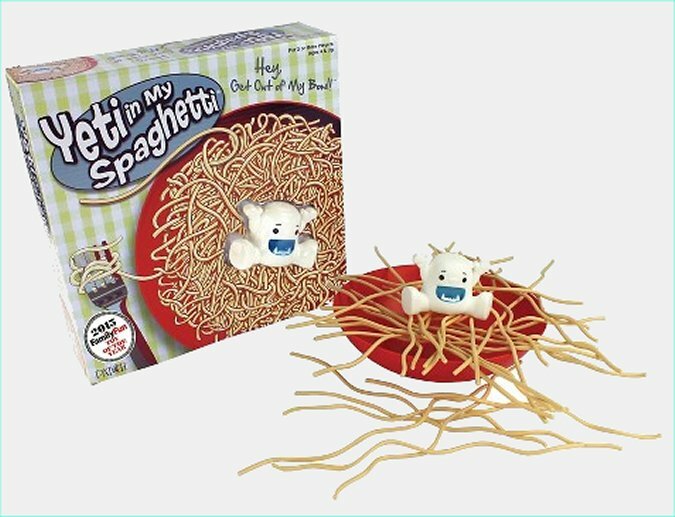 Yeti In My Spaghetti is recommended for ages four and up, but it’s got an addictive quality that makes it hard to resist at any age. Seriously, it may have been the meds, but we played this game for hours. The premise is simple. Inside the box you find a bowl, thirty pieces of plastic “spaghetti,” and a little plastic Yeti. You’ll also find the rules in English and Spanish. They aren’t very complicated. 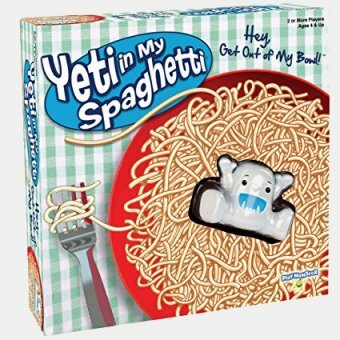 Yeti In My Spaghetti is a great throwback to the goofy, fun games of my youth, and you ought to be able to find it anywhere that games are sold.